Previous Dr. Burke, Why Do Some People Become Nearsighted? Next Dr. Burke, What is Presbyopia? 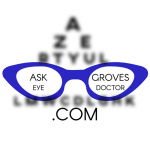 Get the Answer From a Grove, OK Eye Doctor. Diabetic eye disease is a group of eye problems that people with diabetes may face as a result of this disease. Diabetic eye disease may include damage to the retina, the lens and the optic nerve. Regular dilated eye exams are needed to detect any signs of the disease or progression. This should be done yearly or more often depending on the condition.